When Nikki Woodfine met her husband-to-be for the first time it was Friday the 13th – considered to be one of the unluckiest days of the year. But the meeting did not lead to a run of bad luck for Nikki and Michael Iljens. In fact, shortly after deciding to get married they entered a competition to win a wedding – and won. Two weeks after winning the prize, which included the hire of Shottle Hall for the day, the pair’s joy turned to elation when they found out they were also expecting a baby. 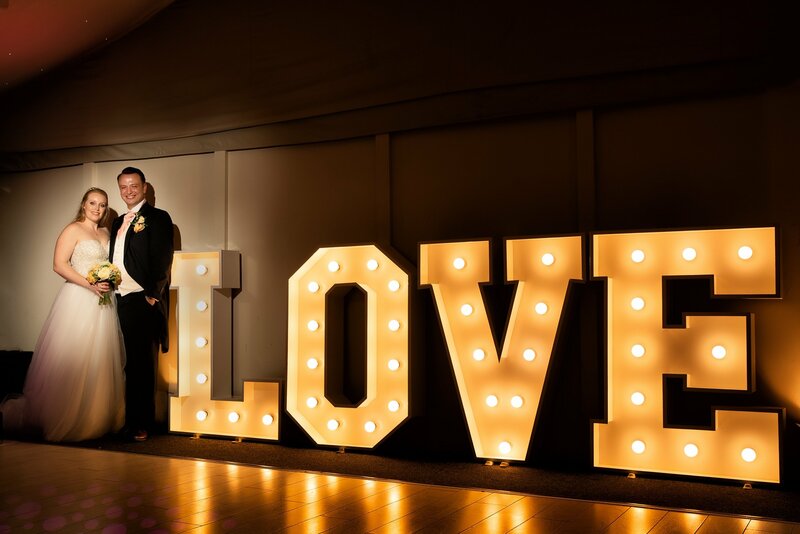 The imminent arrival meant their wedding had to be put back for 12 months, but it meant the pair, who live in Mickleover, had even longer to organise their big day. 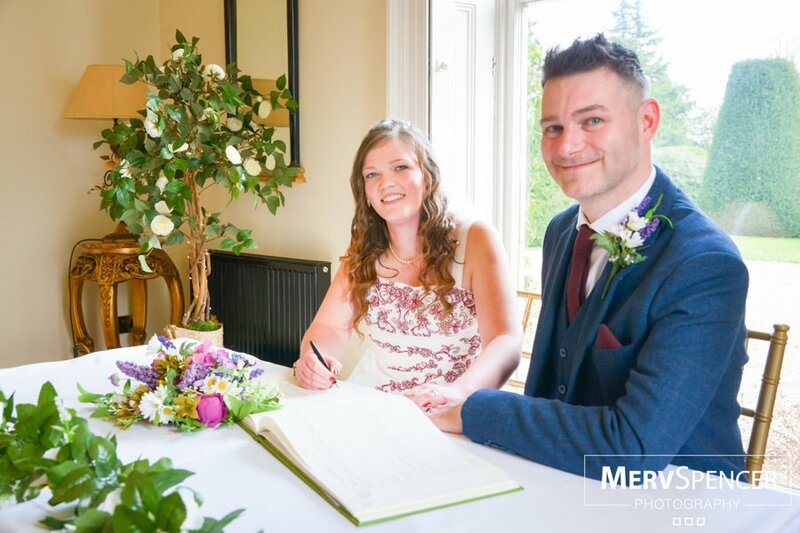 Nikki, 28, said: “We love the fact that we met on Friday 13th, so much so that we tried to book our wedding for a similar date – but we settled for Friday 15th in the end, although of course the year is 2013. The couple met in 2009 when Michael, 28, who comes from Latvia, was working behind the bar of the Crown and Cushion in London Road. Nikki, who works for Bombardier and went in for a drink after work, got chatting to him and has since decided Friday 13th is a lucky day for her. The pair entered the competition at a wedding fair at Pride Park and could hardly believe their ears when their names were read out at the end of the fashion show. They won the hire of Shottle Hall as well as the services of several suppliers including a car from I Do Wedding Cars, a cake and chair covers from Cakey Wakey, fireworks from Fireworks International and photography from Roar Photography. Nikki added: “We had the most amazing day and our daughter Evie was our flowergirl – even though she was not quite one year old. “We do feel very lucky to have found each other and although Friday 13th is supposed to be unlucky and think it’s true to say that the opposite is true for us. Proposal: We had discussed getting married in the past, but I didn’t see Michael’s proposal coming at all. It was on Christmas Day, when we were surrounded by all my family. We were actually having Christmas dinner and I suddenly realised Michael had got down from the table – I thought I must have dropped a sprout to be honest - but he was actually going down on one knee. He had already bought my ring which was a white gold solitaire with smaller diamonds set into the arms of the ring. It was absolutely perfect and I loved it straight away. Wedding date: We got married on March 15th, 2013 which was the nearest date we could get to the anniversary of the day we first met – which was actually Friday 13th! I know they say it’s unlucky for some but as far as I’m concerned it was lucky for me. Shottle Hall: We won the hire of Shottle Hall through the competition – we had never been there before and we were blown away when we did visit. 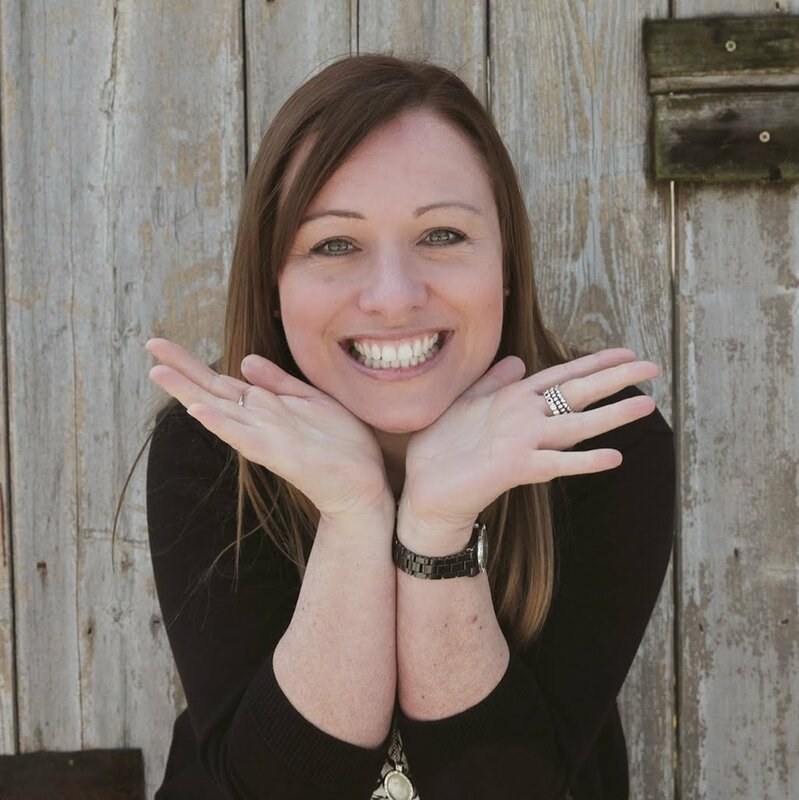 Sarah was our wedding planner and she was absolutely fantastic and a great support to us throughout the planning of our wedding. Every single guest has said how great Shottle was and no one wanted for anything. We feel so lucky to have got married there. Dress: I went to Rococo, in Melbourne, and fell in love with two dresses. I had always pictured myself in a fishtail dress, which was exactly the sort of gown I ended up going for. It was by Pronovias with an asymmetric neckline and silk garza flower appliqués on the the shoulders and at the hip. . It was a mermaid shape with a really elegant frilled skirt and half train. 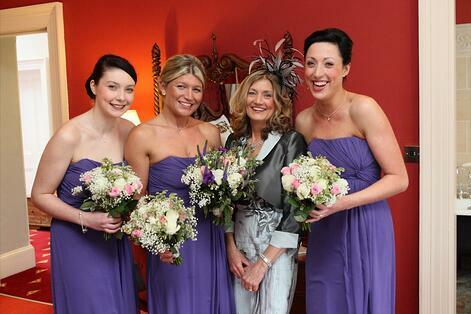 Bridesmaids: I had three bridesmaids – my sister Becky Thompson (33), my best friend Laura Parry (27) and my cousin Charlotte Dyer (17). I got their dresses from Rococo too. They were strapless full length chiffon dresses by Dessey in regalia purple. Our daughter Evie wore a gorgeous flowergirl dress from BHS. Hair and make-up: The Mother of the bride, bridesmaids and my own make-up on the wedding day was done by Amy Shelton from White Feather Beauty who did an absolutely amazing job. I also had treatments from Amy on the run down to the wedding which were lovely. My cousin Rachel Woodfine was the hairdresser on the day and she did a brilliant job. 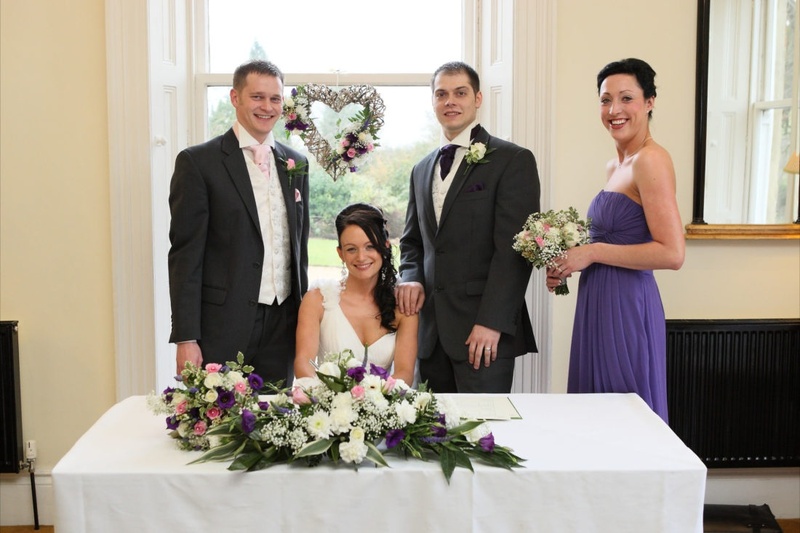 Flowers: My flowers were from Mickleover Florist and they were just beautiful. 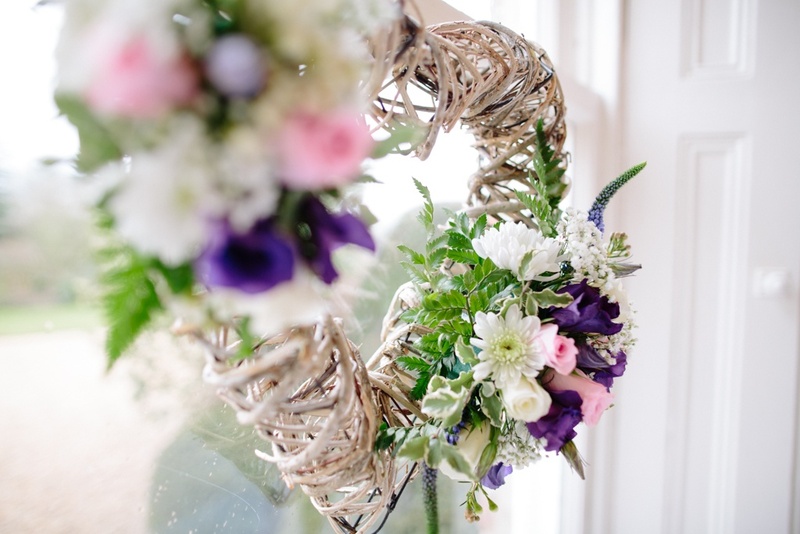 I had a hand-tied bouquet with pink, purple and ivory flowers and the bridesmaids had similar, slightly smaller versions but without the purple. Liz also did baby pink and ivory buttonholes for the men and a large table arrangement which went on the top table. She made me a beautiful wicker heart with matching flowers woven through it, which hung in the window, behind the table where you sign the register. The centerpieces on each table were candelabras and Liz decorated those with fresh flowers for me too. Groomsmen: All the men hired charcoal grey lounge suits from Jon Paul Menswear, in Babington Lane, Derby. Michael wore a purple cravat with an ivory waistcoat and the groomsmen wore baby pink cravats. My six-year-old nephew Jack Thompson was our page boy and my brother James was our usher. Michael had two best men, Richard Beale and Peter Lambert. Ceremony: I walked down the aisle to The First Time Ever I Saw Your Face by Leona Lewis and although I was nervous, once I saw everyone my nerves turned to excitement. My cousin Charlotte did a beautiful reading of Sonnet 116 by William Shakespeare. Michael was quite nervous and was struggling to get his words out at one point, so I had to egg him on a bit! We walked back down the aisle to Your Love Gets Sweeter Everyday by Finley Quaye. 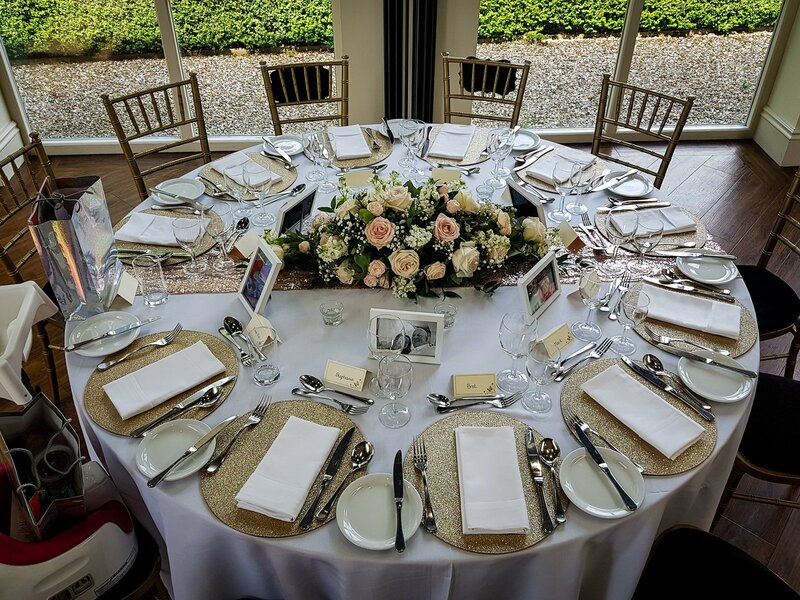 After the ceremony, our guests had winter spiced Pimms and/or bucks fizz and canapes of cherry tomato filled with mozzarella and basil and smoked salmon and cream cheese blini – they were delicious. 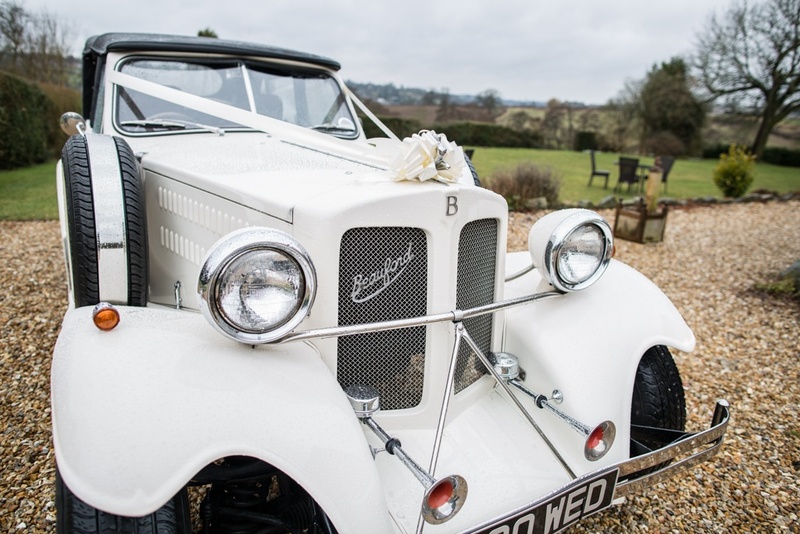 Car: As part of the competition we won the hire of a vehicle from I Do Wedding Cars, which brought Michael to Shottle Hall. We had Elenor, which is a long-bodied Beauford convertible in Old English Cream. After the ceremony Michael and I went for a spin in it and shared a bottle of bubbly. It was really special to have 10 minutes to ourselves, as man and wife, I am so glad we had that little trip. 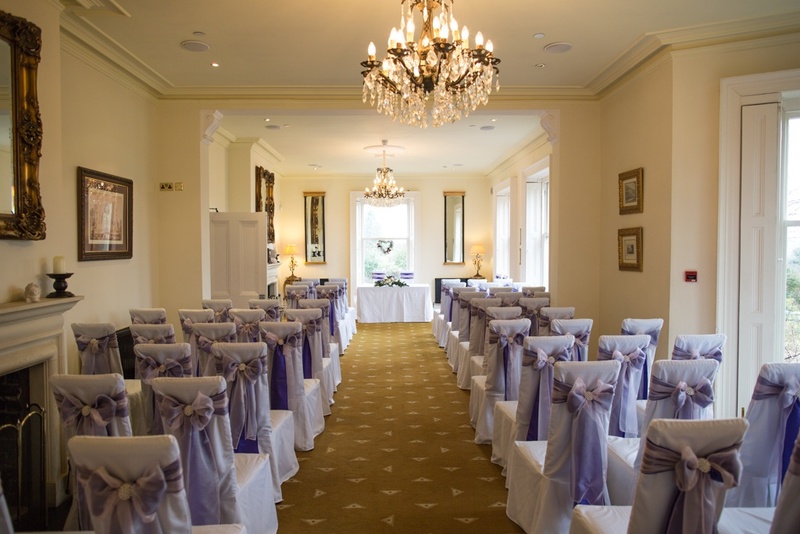 Reception: We had around 60 guests for the day and had the wedding breakfast in The Orangery. To eat we had roasted tomato and red pimento soup to start and then traditional roast topside of beef and Yorkshire pudding for our main, with profiteroles for pudding. Jo from Cakey Wakey provided a generous donation towards our cake and chair covers as part of the competition prize additional to that she did me some amazing favours which were little cake pops and the napkins with ribbons matching our colour scheme and diamanté embellishments. The table plan and names came from Espouse Stationery. 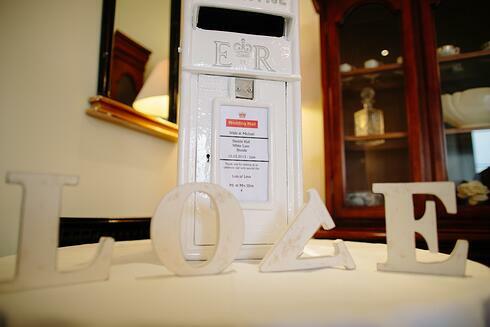 We named all the tables with words associated with love such as Amore, Romance and Cherish. The best man, my dad and Michael all gave excellent speeches. Evening: We had just over 100 guests in the evening and Shottle did a great finger buffet for us. My mum’s cousin was our DJ, Steven Glover, and our first dance was to Thousand Years by Christina Perri. We didn’t prepare anything though, we just had a smooch. We hired a magician called Thomas Wright who I’d found at a wedding fair and he was absolutely amazing. He did performances for small groups of people and he was just so astounding. I would really, really recommend him – everyone was absolutely gob-smacked by how good he was. As part of the prize we also had some fireworks from Fireworks International, which was a lovely touch to the end of the night. On the present table we hired an elegant white postbox from Spirits High for people to put their cards in and we also had a wishing tree covered in hearts from Cakey Wakey. Cake: Jo form Cakey Wakey did our cake – a top tier of fruit cake, a second tier of cupcakes with purple cups and baby pink buttercream icing and a bottom tier of chocolate sponge. The top and bottom tier were decorated with cream fondant icing with pink and purple ribbon round the sides, the top tier had pink and purple hand-made sugar-crafted flowers. There was something to suit everyone's taste. Photographers: I had two photographers, Paul Lyon from Roar Photography who provided his service as part of the competition win and John Webster from Autumn House Photography. Paul did some preparation photographs and the ceremony, then came back in the evening with a Photobooth. The photobooth was a real hit with everyone, people really enjoyed getting dressed up in the costumes and masks provided and having some fun pictures taken. 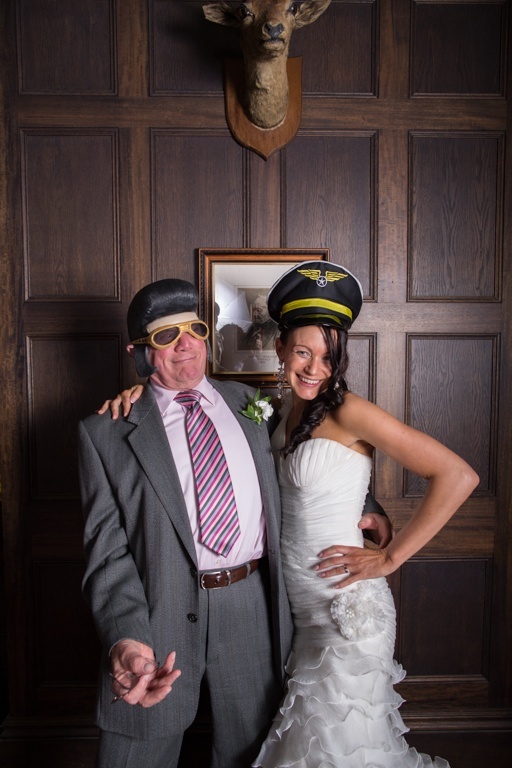 It provided us with lovely record of everyone having a great time as we got copies of all the pictures. 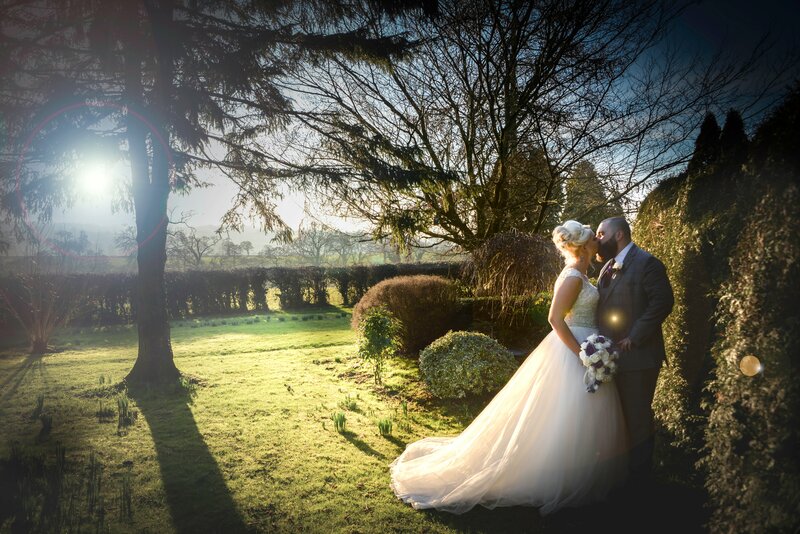 John of Autumn House Photography has provided us with the most wonderful detailed storybook record of our wedding day, from bridal preparations to the fantastic firework display. Honeymoon: Instead of wedding presents we asked guests for contributions towards our honeymoon and we are going to Cyprus for 10 days in August.